Ponikem is 47 years old and has a farm where she keeps ducks and chickens. She lives with her husband and a school-aged child. 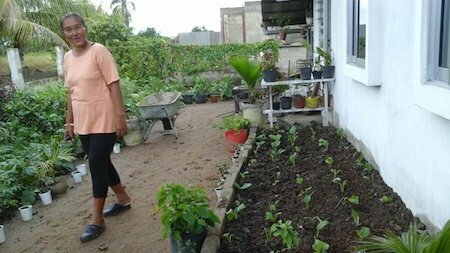 Besides keeping chickens and ducks, she also plants vegetables and sells various types of pastries on her bike to meet the needs of her family and to pay school fees for her child. Ponikem is planning to renew her chickens' pen, for which she also needs to treat the surface by land filling. She is lacking finances to do this and approached Seva MFI for a loan of SRD 2,500. Congratulations to Ponikem in Suriname..!